← Wonka Weekend Preview! – Super Skrunch and Oompas! Evolution of the Skrunch! Willy Wonka’s Super Skrunch, that is. As I teased yesterday, today’s article is the first half of a two-day span of coverage for the original two Wonka candy treats. 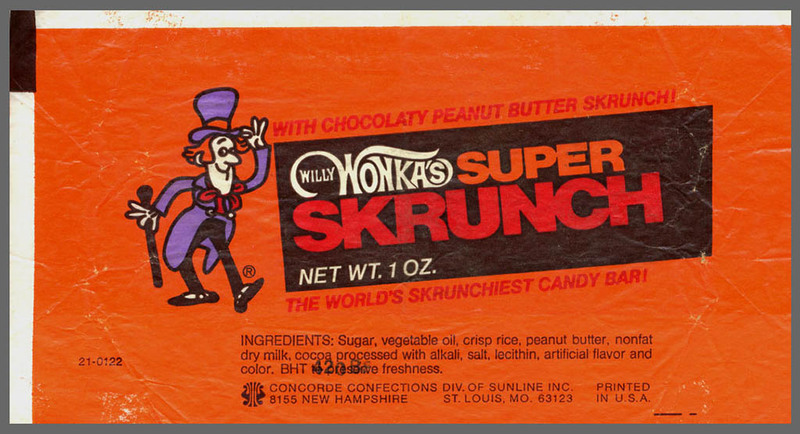 Today, we’ll be talking about Willy Wonka’s Super Skrunch. It might sound like an odd name, but for nearly a decade it was the chocolate bar face of the Wonka brand. I’m going to be revealing wrappers today covering the entire life cycle of the bar, as well as its ultimate end. Many of the pieces I’ll be showing can’t be found anywhere else, and today marks the first time most of these will be seen in the internet age. 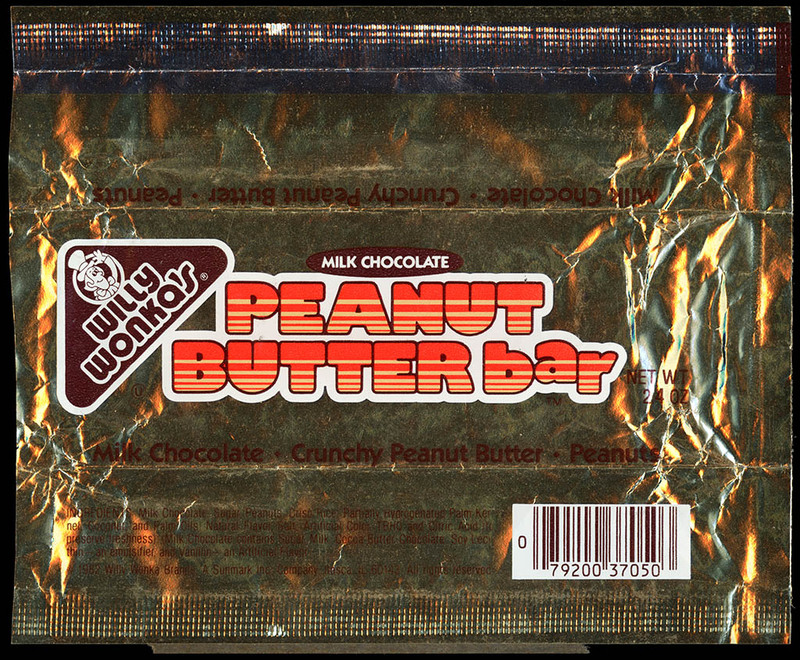 I recall gleefully consuming these bars on a number of occasions, and when I see this image I can nearly taste them again – that great peanut butter texture clear in my memory. Yum! 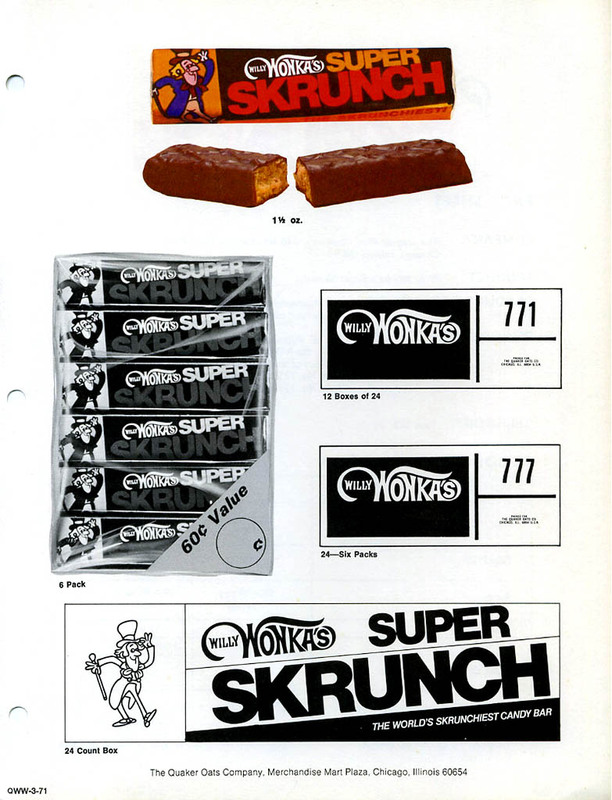 1981 marks the first wrapper that lacks the Concorde company name, now replaced by Willy Wonka Brands. 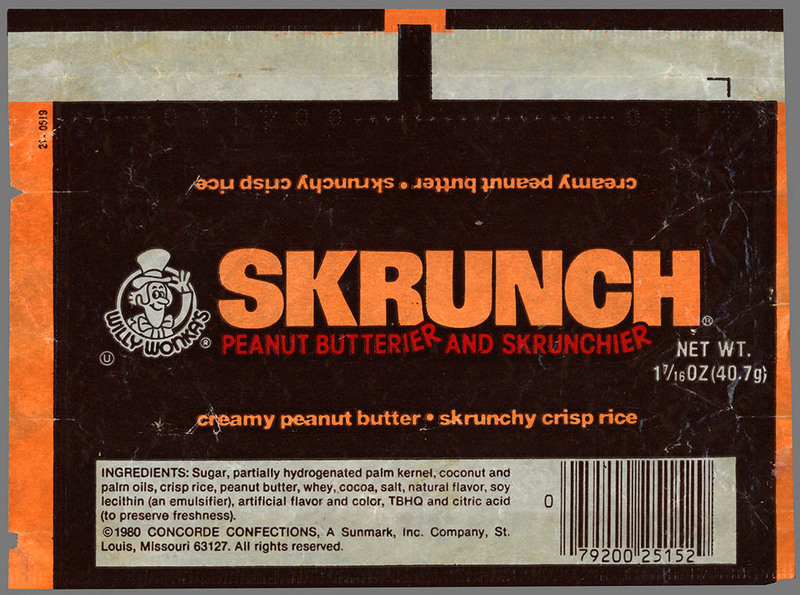 It’s impossible to know what led to the discontinuation of the Skrunch brand name, but we can assume that it simply wasn’t competing well enough in the marketplace. There must have certainly been changes in the company that might have led to some arbitrary desire to evolve and re-align the brand offerings. Though 1981 was the end of the Skrunch bar in name, it turns out that it was not entirely dead. Several months ago I made a startling discovery when I learned of the existence of a Willy Wonka Peanut Butter Bar, from 1982. 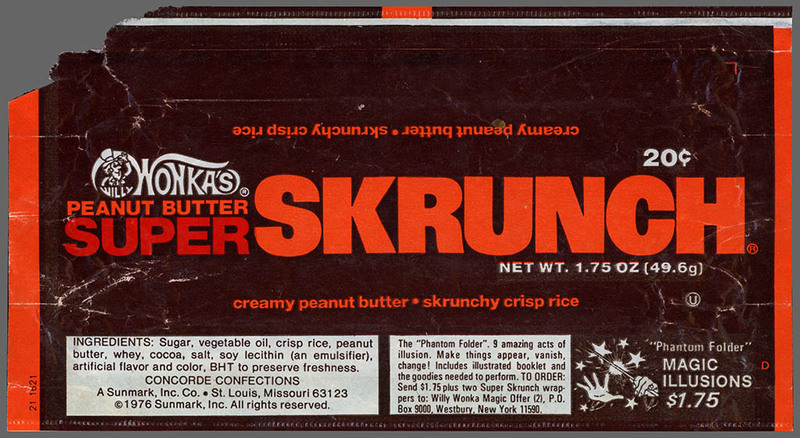 Upon close examination, Willy Wonka’s Peanut Butter Bar has an ingredients list which matches exactly the ingredient list of 1981’s Skrunch bar. I can’t be sure, but my suspicions are that Willy Wonka’s Peanut Butter Bar was short-lived. 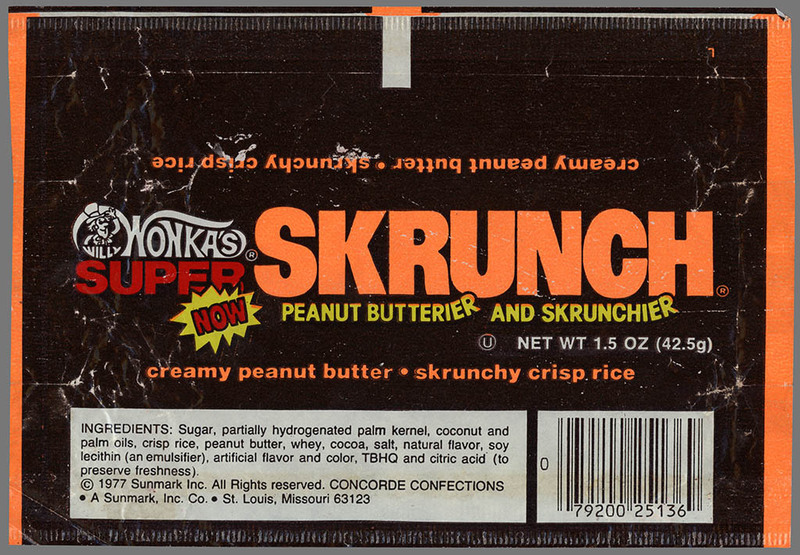 It was a dramatic redesign and re-branding of one of the two launch-pieces of the Wonka candy company – a final attempt to keep the Skrunch bar going, if not in name, at least in content. But sadly it didn’t last. 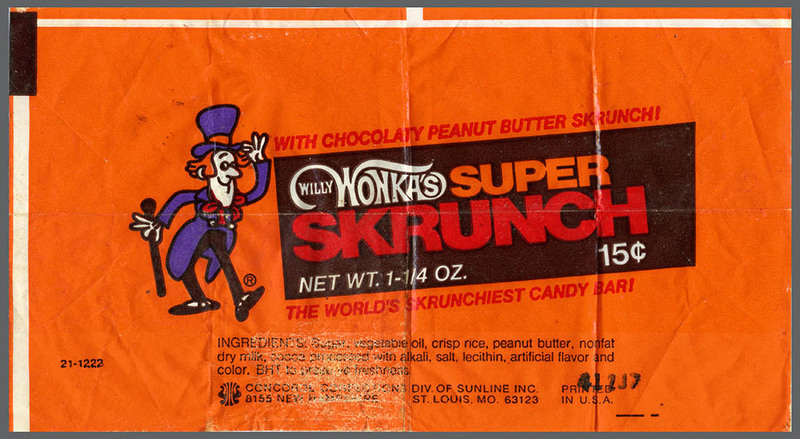 So, what began in 1971 as Willy Wonka’s Super Skrunch bar, ended in 1982 as Willy Wonka’s Peanut Butter Bar. Beautiful in gold foil, but destined to become a near-forgotten part of confectionery history. And that’s everything I’ve got to share today with regard to the history of the Skrunch. Come back again tomorrow to check out our look at one of my all-time favorite treats: Willy Wonka’s Oompas! This entry was posted in 1970's, Chocolate, Peanut Butter, Wonka and tagged 1970's candy, 1970's candy bars, 1970's Willy Wonka, 70's candy, 70's candy bars, 70's Wonka candy, candy collecting, candy collection, candy collector, candy wrapper collection, candy wrapper collector, collectible, collecting candy, confectionery, confections, packaging, Skrunch, sweets, vintage candy wrapper, Willy Wonka candy, wrapper. Bookmark the permalink. 25 Responses to Evolution of the Skrunch! Willy Wonka’s Super Skrunch, that is. 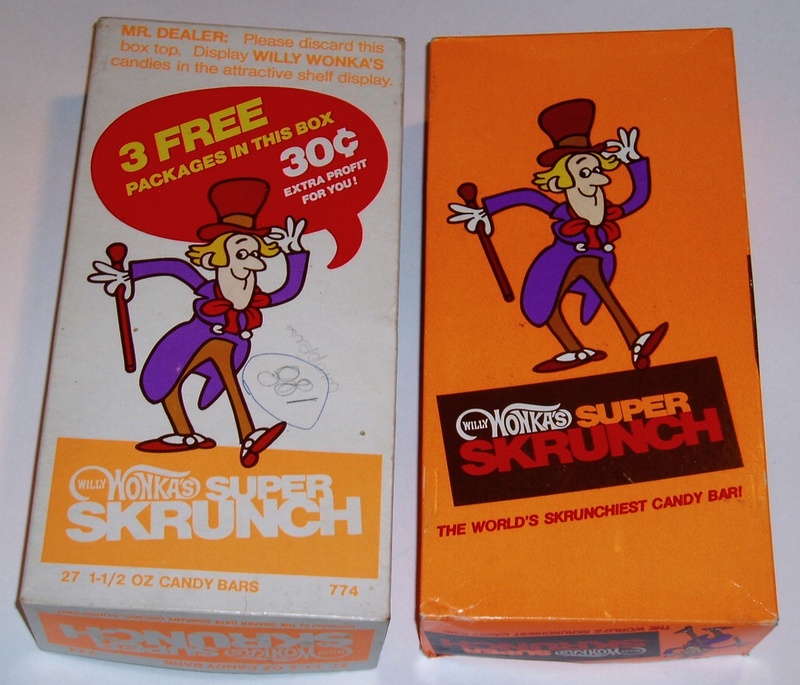 I remember the Super Scrunch bar with the 1970s wrapper. I remember very distinctly, after swimming at the Pawnee Park pool, we’d go to the Candy Shack and have one of these nearly every visit. Well it’s a good thing Mr. Dealer *didn’t* discard that box top! Maybe the Wonka folks will see your post and do a revival of Skrunch and Oompas… if we’re lucky. 4th grade 1971 east view Americus,Georgia. These were awesome!!! I used to by them by the case as a kid. Can we get these anywhere? Are they coming back?? Wish they would bring back the best candy bar ever made! Haven’t found anything remotely close. Comic Book Day was every Thursday afternoon in 1976. My junior high was 2 blocks from the local drugstore, just outside of O’Hare Airport. 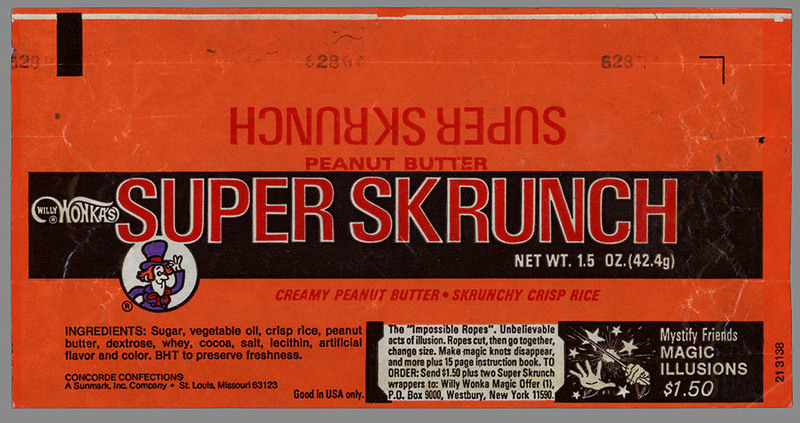 A Super Skrunch bar always inevitably sat atop my weekly stack of books on the register counter. Its my favorite mass market chocolate bar to this very day. So damn tasty. And the rice made the interior perfectly light. Awesome. THANK YOU VERY MUCH for the photos & information. Great job. You put a smile on my face this warm summer evening. I’m a happy 6th grader all over again! Anyone have the recipee for the candy bar? Was my favorite and then they quit making it. The recipe, if it even still exists at all, would be locked away in the corporate files of Nestle at this point. And they don’t give stuff like that out, because they might one day use it for something. But my guess is that since the bar was discontinued by the time that Nestle bought Sunline/Sunmark/Concorde, the actual recipe could be lost forever. This remains my favorite candy bar of all time. I was very disappointed when it disappeared from shelves. My understanding from something I read years ago on the Web was that was discontinued due to the fact that it tended to be “meltier” on shelves than other candy bars tended to be, but I’m not sure I believe that. Thanks for your comment. 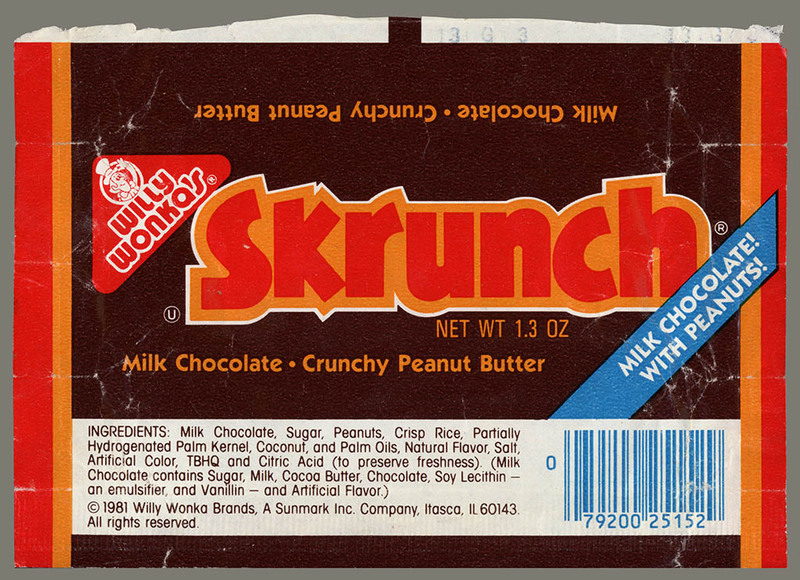 The Skrunch bar is one of my all-time favorites as well. The mythology around why certain products are discontinued can sometimes be based on fact, and sometimes based on fanciful notions. I suspect the “melty” argument falls into the the fanciful notions group. If there was a problem with the “meltiness” of the bar, I just don’t think it would have been on shelves for a decade. Inevitably, these things come down to money. 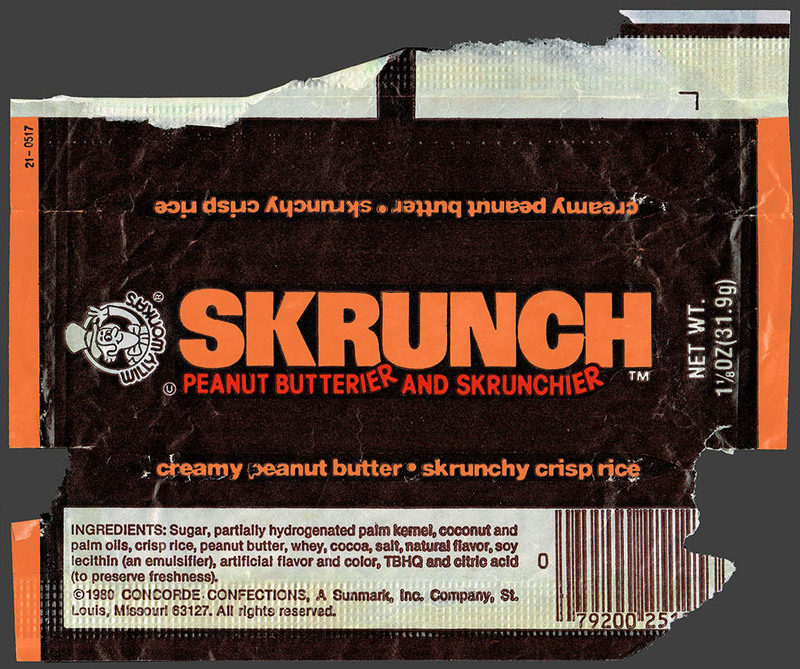 And to me, it seems clear that in the final years of the Skrunch bar, they were trying to play with the marketing to make it sell better than it was. 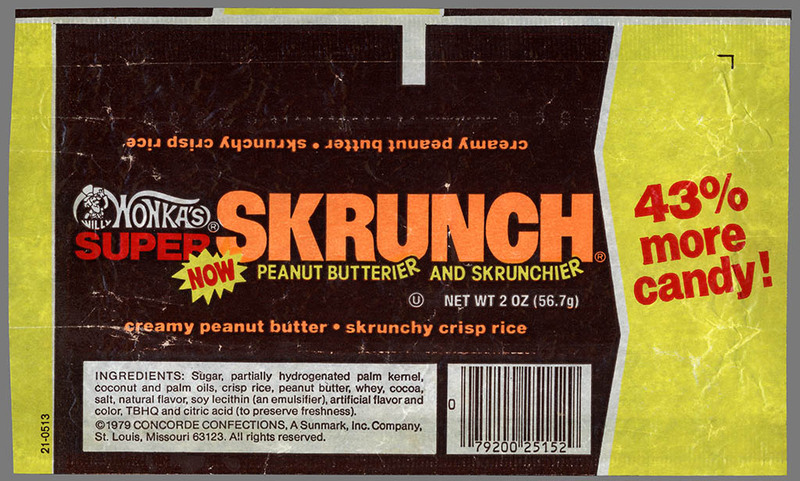 After all, it went from “Super Skrunch” to “Skrunch” to “Peanut Butter Bar”. That seems to indicate the bar had branding problems, not melty problems. And the name-changing is at least concrete evidence of something. Though, without word from someone who worked on the brand for Wonka at the time, we can’t know for certain. Agreed on all counts. I only know that I would love to have another one again someday, and that’s pretty unlikely. What got me thinking about this was the fact that I just ate a Whatchamacallit, and was lamenting the fast that they changed the recipe on that many years ago, too. The original was so much better…but Super Skrunch beat them both. This was my favorite candy bar. I wish they would bring it back. There’s nothing like it out there that is this good. 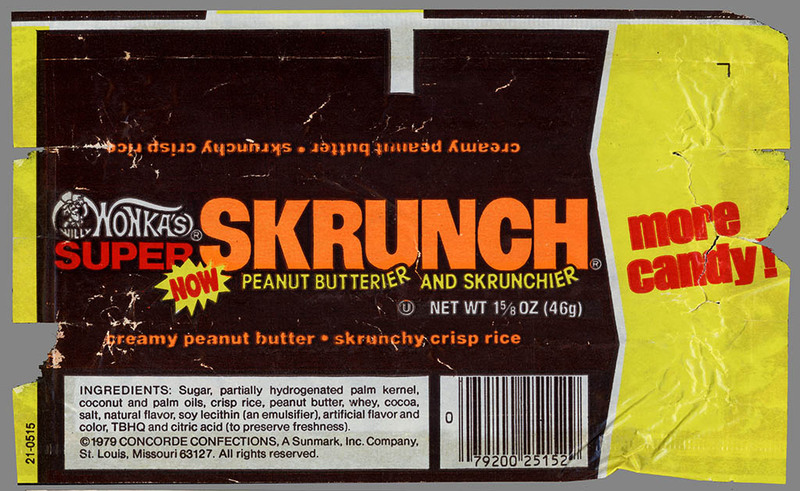 I loved the skrunch bar…! I was just thinking about it, and decided to look it up on the Internet to see if it was still sold somewhere. I used to eat it all the time in the mid 70’s til the end of the 70’s. Used to grocery shop with my mom in grade school and she would let me pick a candy bar. 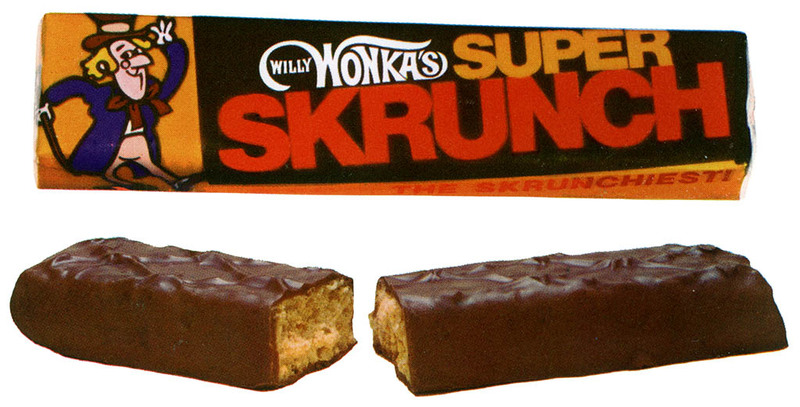 It would either be skrunch or a marathon bar which wasn’t made by wonka but was tasty anyway! 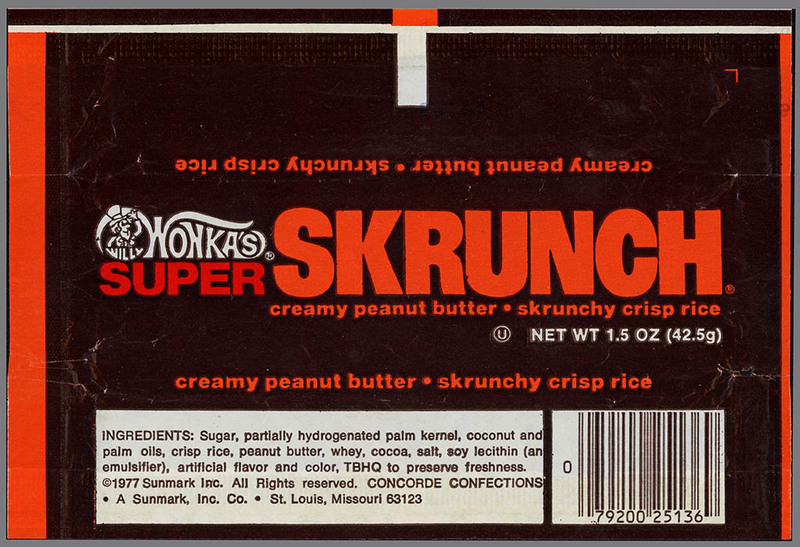 LoL.thought about the skrunch bar a lot over the yrs. Knowing my kids and grandkids will never know how good they were…that’s sad. I loved this candy bar. My 3rd grade teacher Mr. Foose read us the book and then one day hid one in each of our pencil boxes. I hadn’t seen my box since day one of school but he carefully dug it out from behind my papers put the candy bar in the box and re-buried it behind all the junk in my desk. Great memories! I can almost taste it when I saw the picture of the wrapper. They need to bring this back. Came here to see if my favorite candy, Willy Wonka’s Super Skrunch, was still being sold somewhere. Sad to see it’s truly discontinued. I haven’t found anything better, except maybe on par with Ferrero Rocher. Hopefully, some confectionery reading this will feel it’s worthwhile bringing back the Skrunch.